Looking for a cheap ticket to Paris? Here you can search all major low-cost airlines for cheap flights to Paris. Before you book a flight you can use Utiket to find the cheapest flights to Paris for Air France (AF), British Airways (BA), Lufthansa (LH), Alitalia (AZ), Flybe (BE). All flight data are real-time and accurate. Follow the links to search and book your cheap ticket to Paris directly with the airline or one of our partnering travel agents. The metropolitan area of Paris is being served by several airports: Paris Charles de Gaulle Airport, Paris Orly Airport, Paris Beauvais-Tillé Airport. You can find more information or the cheapest tickets to all these airports here on Utiket. Paris Charles de Gaulle Airport is with 65 million passengers a year the largest international airport in France and second-largest in Europe (after Heathrow). The airport is located about 25 km northeast of Paris and was named after the French President and French General in WW II, Charles de Gaulle (1890 – 1970). This is one of two airports serving Paris, the other one is Orly Airport (ORY), located 15 km south of Paris. The CDG airport was built in the late 1960's as the Paris North Airport but was renamed to Charles de Gaulle on opening in 1974. Read more about Paris Charles de Gaulle Airport. Paris Orly Airport is an international airport and one of two airports serving the capital of France, Paris, the other one is the larger Paris Charles de Gaulle Airport. The airport is located about 15 km south of the city center and is with 30 million passengers a year the second busiest airport in France. Before the construction of Charles de Gaulle Airport (CDG), Orly Airport was the main airport for Paris and although most international traffic has been transferred to CDG, Orly has more domestic flights. Read more about Paris Orly Airport. Read more about Paris Beauvais-Tillé Airport. This is a list of all airlines flying to and from Paris and how many flights and destinations they serve. 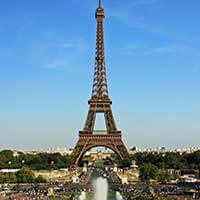 You can see a complete list of airlines and flight options to Paris.